Study Medical Photos: A 42-year-old woman presents to the emergency room complaining of shortness of breath and palpitations. hypotension, shortness of breath, shock, decreased level of consciousness, or chest pain suggestive of coronary ischemia. Determining whether a patient’s symptoms are related to the tachycardia depends on several factors, including age and the presence of underlying cardiac disease. 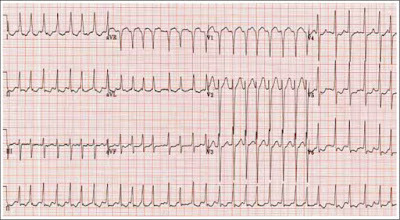 Paroxysmal supraventricular tachycardia (PSVT) with a heart rate of 200 bpm may be tolerated by a healthy young adult with no or few symptoms (e.g., palpitations). 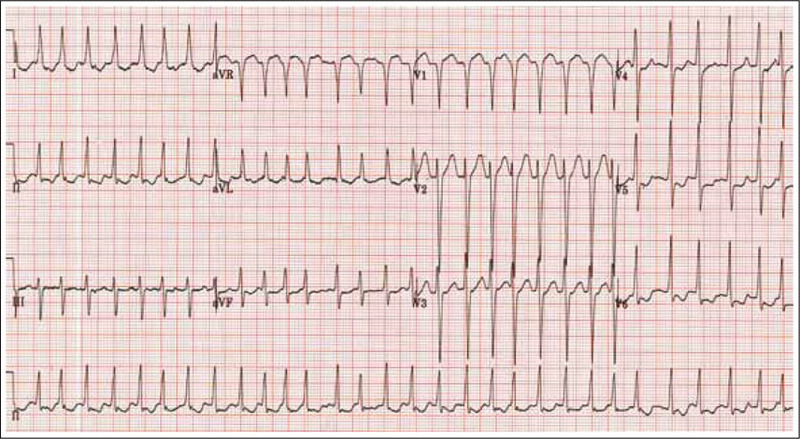 However, a heart rate of 120 bpm may precipitate angina in an elderly patient with significant coronary heart disease. Adenosine is approved by the Food and Drug Administration (FDA) in the United States only for the intravenous management of PSVT in which the atrioventricular (AV) node is involved. For intravenous adenosine administration, the patient should be supine and should have electrocardiographic and blood pressure monitoring. The drug is administered by rapid intravenous injection over 1 to 2 seconds at a peripheral site, followed by a normal saline flush. The usual initial dose is 6 mg, with a maximal single dose of 12 mg.
adenosine if WPW is a possible mechanism, and emergency resuscitation equipment should be available.